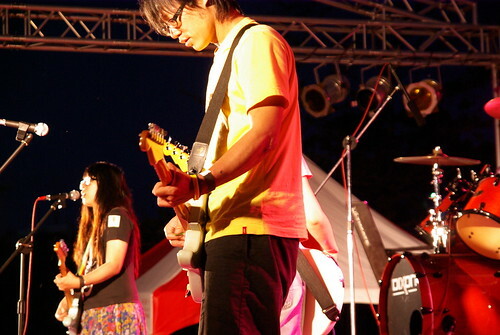 One of the bands that marked my trip to Spring Scream 2008 in Kenting, Taiwan, was Orange Doll (blog). It was one of the small bands that I discovered on my first night there. Hailing from Kaohsiung, Orange Doll is a three-girl, one-boy band that plays this sort of indie pop rock that I like a lot, with soft vocals provided by front-woman Wama. Another band member, bassist Yuco, cites HK’s My Little Airport as one of the bands she likes. Earlier in January 2009, they were part of a show at Taipei’s The Wall livehouse called Voices from the South (Chinese).